My little office space now lives in the 3rd story, with a window opening out into the tree tops. Squirrels bounce around, birds flit by, and I'm reminded of why I love summer. The heat can't beat the joy, so let's milk the last part of summer for all it's worth. The LVX Summer 2016 collection features 6 colors that completely represent the good vibes of summer. I've already used LVX for lemon nail art in the past, but I was struck by another pretty lemon pattern that I thought went well with some of these colors, so here's LVX in lemon, part two! These baby lemons were probably about as easy as raising an actual baby, with tweezers. And I still didn't get the level of detail I wanted. I'm really excited about the brushes I used for the designs though. If you're a nail artist, you've probably amassed at least 43 brushes for detailing your designs. 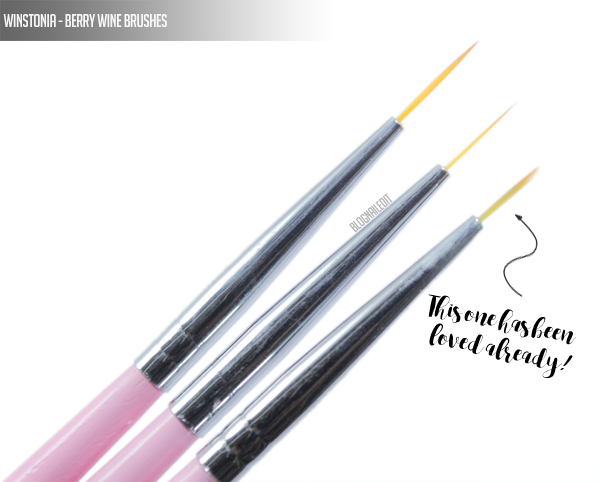 I've got another 3 you need to add - the Winstonia Berry Wine brushes. The bristles on these 3 brushes are very thin, which makes detailing easy and controllable. You don't even need to trim them, as the shortest one is the perfect length. I've already used mine, so it doesn't look as thin as the freshly unpackaged ones, but trust me, you need it, especially if it's only $5.95! Now, I know you all know how big of a fan of yellow I am. 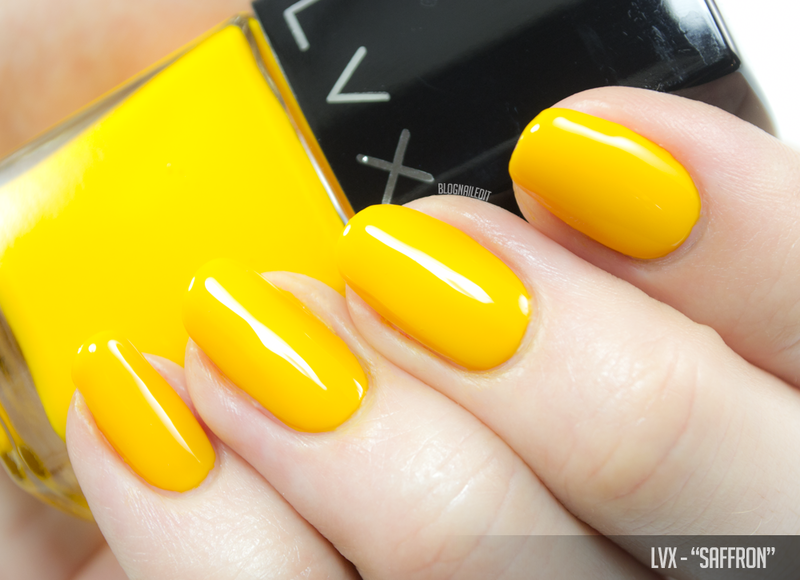 My blog's been yellow for years, and every post that includes a yellow raves about it, but Saffron (2 coats) was a tricky beast, even though it ultimately produced a gorgeous mani. In fact, truth time - I used my blog's name to cover up some of the messy yellow cleanup that failed on my ring finger in the nail art shot. See it? If you get any of this shade on your skin, you'll be stained a bit until a few hand washes sloughs off those stained layers of skin. The taxi yellow also has a bad formula, almost like an old polish that's dried out and has become thick and gloppy. 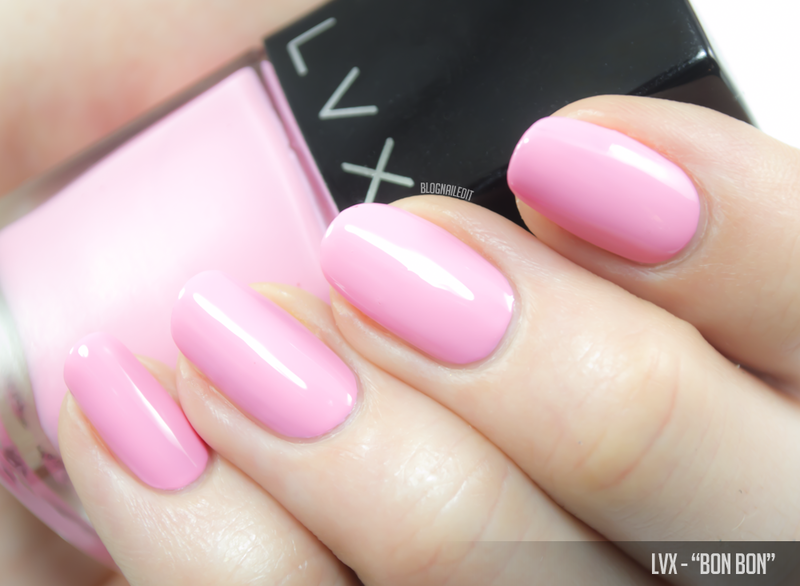 Bon Bon (2 coats) is a baby bubblegum pink with a normal, controllable formula. Argh this is so frustrating! The two colors I was most excited about, Saffron and Coquelicot (2 coats) have awful formulas. 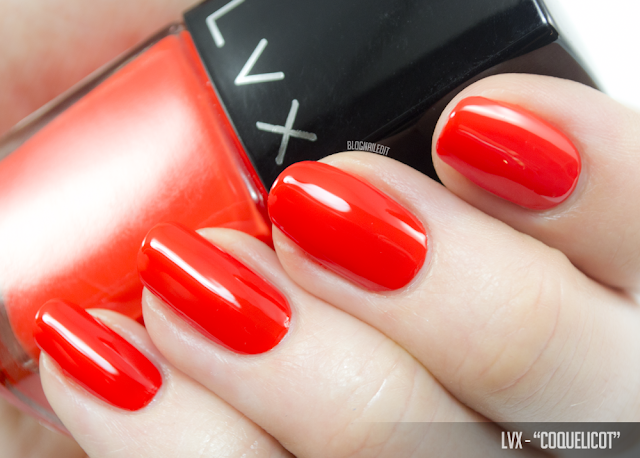 This bright orange-red creme couldn't smooth out well no matter how quickly or slowly I moved. 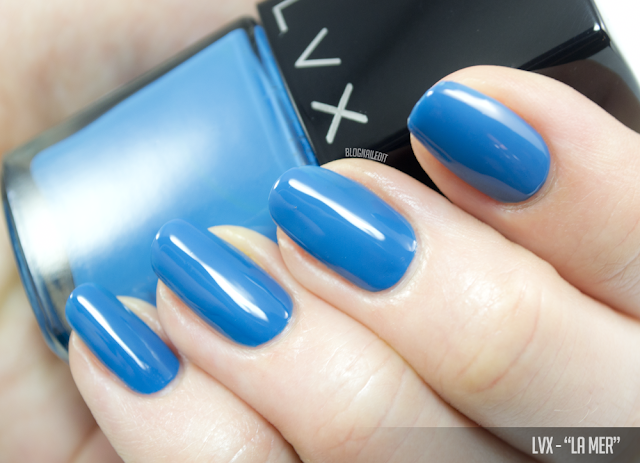 La Mer (2 coats) was a pleasure of a formula, and an interesting color too! It's a dark but bold tealy blue. 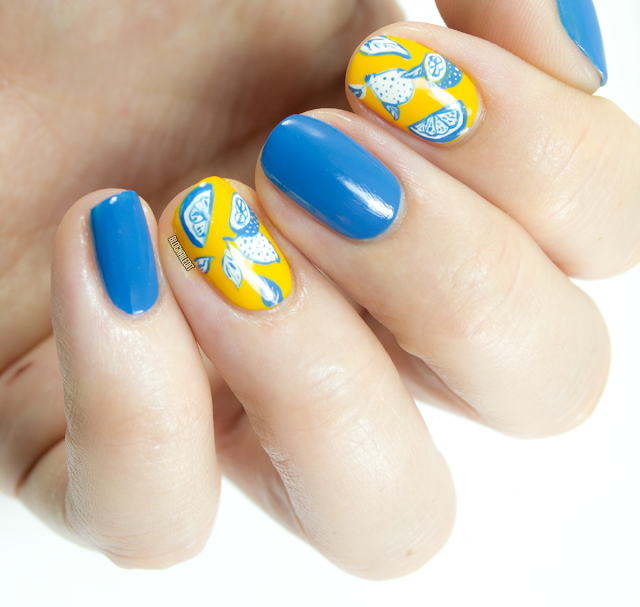 You can see that even in the nail art up above, it works well and doesn't show colors beneath. Lush (2 coats) is a lovely sage creme polish with the formula I expect from LVX - easy to apply and covers easily in two coats. 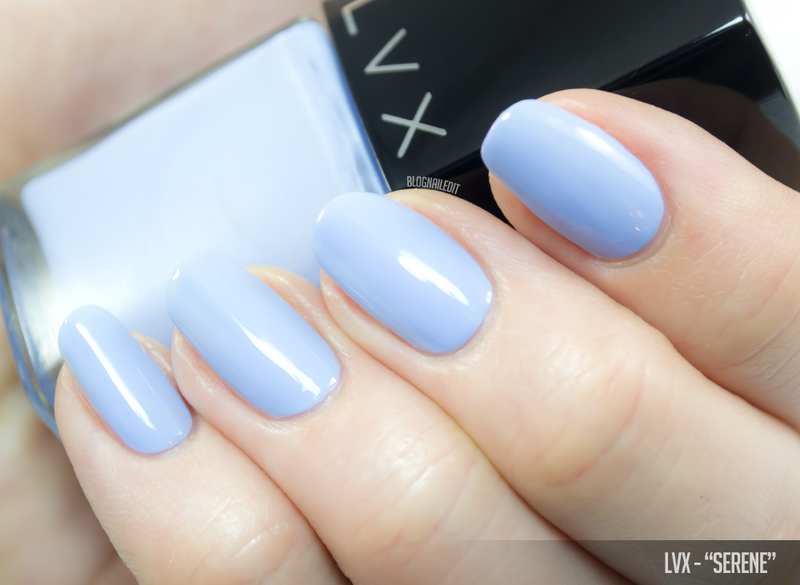 Serene (2 coats) is a sky blueish-periwinkle creme with another easy formula. I want to recommend the whole collection to buy, but I'm so frustrated with the awful formula of Saffron and Coquelicot that I simply can't. 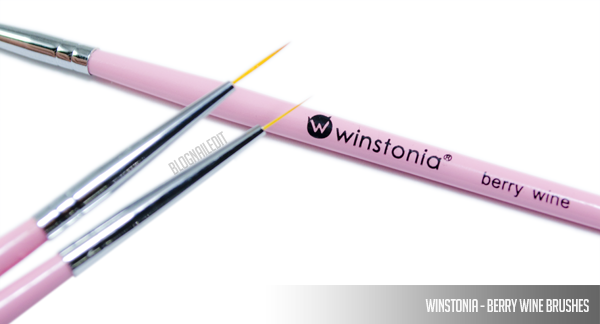 So pick and choose what you like from the collection here, but do NOT miss the Berry Wine brushes from Winstonia here! Wow, those are some seriously detailed lemons! Love it!